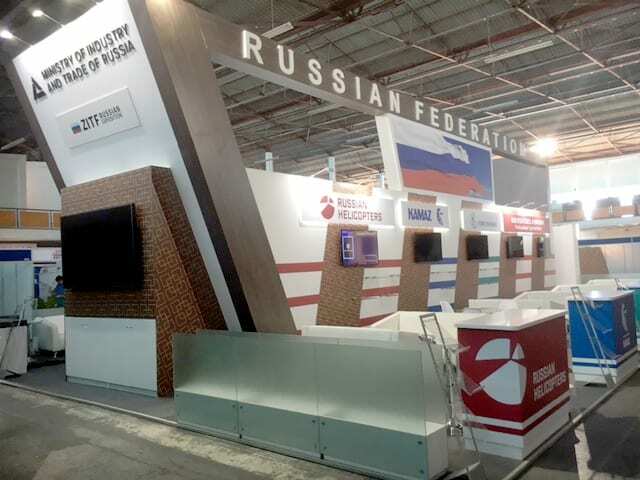 3D Design recently travelled to Zimbabwe to build a 198m2 ‘full on’ custom stand for the Russian Federation at the Zimbabwe International Trade Fair. Despite border delays, the build went smoothly and impressed both client and Zimbabwean President, Robert Mugabe. The team of 13 – including audio visual specialists, electricians, carpenters and graphic applications – was managed by 3D director Ivor Allison and Nick Brand – travelled in a convoy of three 8-ton trucks and one 5-ton truck, but was delayed at the border for three days because of a public holiday in Zimbabwe. Allison picks up the story: “The three days lost at the border put the team under tremendous pressure but – as usual – the guys delivered on time with a smile. When I arrived just over 36 hours into the build, it looked as if they’d been at it for days, not hours. And, when the client arrived 12 hours later, all that remained to complete was the audio visual hook up. “Graphics applicator, AV technician or carpenter, the guys worked like a well-oiled machine; I can’t tell you how proud I was when the client walked around the stand purposefully looking for flaws and couldn’t find a single one. “The cherry on the top was that President Mugabe and the Russian Minister met in the boardroom on the stand and, when the President exclaimed how impressed he was with it, the Minister said he could have it!